It’s adorable. It’s safe. And it just wants to be your friend. Blinky™ will definitely paint your dreams in bloody red. 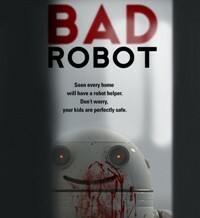 Written, directed, and edited by Ruairi Robinson and funded by the Irish Film Board, this 12-minuter suspense film tells the story of a young boy who purchases a robot helper to be his playmate. But just like any child, the boy gets bored with Blinky and puts all of his frustrations and childhood pangs on the poor robot. As Blinky’s system reboots, things turn out viciously bad. The CGI effects and cinematography of the film was surgically precise and artfully done. With a budget of 45k euro for the shoot and a visual budget of zero, the creators have transformed this film into a mini-masterpiece of great twists and imagination. The visual effects were only done in nine months. Some of the standout scenes are those where Blinky stays out in the rain. It is really hard to make CG characters wet in the rain, but the creators have really juiced out their creative mojos to make it look realistic. The gore factor is flawlessly done that it will not leave you sick in your stomach. The boy, Max Records (from “Where The Wild Things Are”) is a bombshell of a talent. The emotion he contributes to the scenes make a solid foundation throughout the film. His role was very important to trigger a lifeless being like Blinky, and he did it with such intensity and potential. The film’s cinematography is by Macgregor while the nicely done music is by Olafur Arnalds courtesy of Erased Tapes. Overall, Blinky™ is an extremely satisfying short that alternates sweetness and drama with enough suspense to give you a chilling experience. It’s that kind of film that will bring back your love and fear of robots.